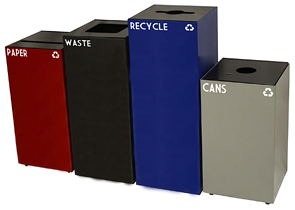 Compact, fire safe, steel-constructed recycling containers, Geocubes are the perfect addition to any recycling program. 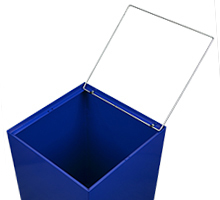 Item specific decal labels and lid openings encourage the proper disposal of recyclable materials. 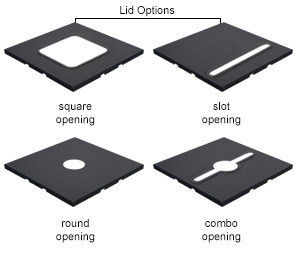 Liff-off lids further maximize maintenance efficiency. All Geocubes come standard with two decals as listed, *alternate decals are available to swap out for one or both of the included decals. 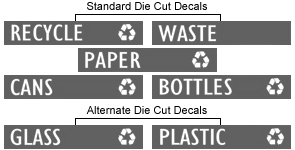 The included die cut transfer decals	are bright white vinyl and designed specifically for easy application. Legacy decals are available to match Geocubes that were purchased prior to 12/1/2013.